What is the charging port? USB C? Micro USB? It's Micro USB. And while I'm at it (I should do a review)... I bought this mostly for phone calls and secondarily for music. Musically, there is no discernible bass, but the treble is quite clear. I heard songs I know from years ago and could suddenly hear the lyrics. But these are no beats. As for phone calls, because the ear pieces seal (a plus for me), they are quite annoying for talking on the phone. The charging box port is micro USB. I holds a charge for quite a while. I usually only change the box once a week or so. And it always keeps the ear buds fully charged. Charging is all done via Micro USB; the pods themselves charge via the storage case. micro usb. IIRC, it comes with a cable, but no brick. Micro USB. Short cable included. How can you tell the right from the left earbud? They appear identical to me. BEST ANSWER: When you remove them from the case or turn them on you will hear "Power on" from each bud. When both have powered on you will hear "Connected" from each one. Then the left one will say "Left channel" then the right will say "Right channel" followed by the left one saying "Second device connected". If you only power on the right bud it will only say "Power on" since it is only a slave to the left one and will not not connect or say "Connected" on its own. They literally tell you when you first put them in your ears: "Left Channel"; "Right Channel". I've never had a problem with that, though. The left one goes straight from the left spot in the case to my left ear and back again, etc. Since the buds need to be in the case to recharge, there's never much reason for them to be anywhere else. I don't see any identifying markings on them, they appear to be physically identical. They are identicle except for which is left and which is right audio. Since I dont listen to things where the panning matters, I just pop them in. They fit exactly the same. If the panning is an issue, I would suggest switching out one earpiece with one of a different dfeeent color. I personally can't tell just by looking at them. But when you turn them on, they tell you audibly in the earpiece whether they are left or right. They are marked 'L' and 'R' respectively. They also audibly announce what side channel each is when turned on. The earbuds identify audibly “left channel” and “right channel” when powered up and paired. Next to the contacts you will see a letter "R" or "L" it's barely visible, but it's there. Near the contacts there’s an L and R printed on them, fairly faint on mine. There is an "L" on the Left one and and "R" on the Right one. They are marked 'L' and 'R' respectively. There is an L and an R on the inside. How do you charge yourMonoprice True Wireless? BEST ANSWER: The earphones go back into the case. There is a Micro-B connector that you plug your USB cable to your charger. the case is your charging station. There's a USB cable, only about 3 in Long, that you plug into your laptop or whatever and then the other end goes into the case. You place the earbuds in the case and they charge while they're being stored. The case has a battery in it, with four metal pins that connect to the headphones. The case itself charges via a USB Micro Type B plus (common on older Android phones and most small consumer electronics). if you buy them, monoprice will email you to answer other peoples questions constantly. These are great headphones for people who want to help monoprices customers. The case is a charging pod, essentially. It has a built-in battery that will charge the earbuds about 4 or 5 times before the case needs to be charged. Return the earbuds to the case and they recharge from the battery built into the case. The case recharges via micro USB connection. With a charging cable that can be plugged into the case. The case is like a power bank for the ear buds. It comes with a USB to Mini USB for charging. These are amazing, the charge lasts about four hours. It has a micro USB on the case. The earbuds charge when they are in the case. use the USB cord and insert it in the back of the base. Did anyone get a manual explaining the pairing process and the use of buttons? I received nothing. BEST ANSWER: Product manual is available from the product page below the description. Yes, I have the manual - it's minimal but adequate - about 200KB. I'm not sure how to get it to you though. I can tell you that if you put the earphones in your ears and press the LEFT (main) button, you will hear: "pairing" as it joins the right earphone. If your smart phone's blue tooth is turned on , "TWS" will appear as a new device. Click or select it. After the first pairing, when you put the earphones in your ear press the left button, you'll hear "pairing" followed by "pairing with second device" as it pairs with your phone. When you put the earphones into their charger, they unpair, turn off, and start charging. If you have a specific other question, I'll try to answer it for you. You can hold down on the button for roughly 5 seconds to pair If I remember correctly and approximately 10 seconds to shut them off. Pretty typical that you can also click the button once to stop or start your media too. Yes. I received a very brief folded paper manual explaining pairing and button operation. It may be in the bottom of the box. Im sure the folks at MP will gladly walk you through the process! Correction, I said TWS in your smart phone - It's MP-TWE. There was a getting started user guide in the box. These are worth double the value. They work flawlessly, sound great and connect effortlessly. They come with several size ear buds, a very nice charging station and are as clear as a bell. I would buy again and again. They are small enough that they fit almost un-noticed. The case plugs into a wall charger, same as charging a cell phone. Just keep the earphones in the case during this. While on the go, the case acts as a battery and will charge the earphones when they are stored in it. You charge the case with the micro USB port and the case will recharge the ear buds several times before the case needs charging again. The individual earbuds charge via the case which has battery life for a few charges of the earbuds. The case is charged via USB. The case is the charger. They charge while in the case (when plugged in). There is a USB cord that comes with it. The case is the charger. Drop them in and they charge. To charge the case you have to use a MIcro USB B cable. i threw away the instructions on accident and have no idea how to pair them! Do you know how? BEST ANSWER: Manual is downloadable from the bottom of the product description page. Press and hold power for 3 seconds when turning them on. Look for MP-TWE on devise search. Once the battery is charged, hold the button down on one of the ear pieces until you hear the voice say "pairing" and watch for "MP-TWE" to show up on your Bluetooth device. Select that and it should be paired. The voice will then say "connected". In my experience, the earpiece may power on when you first remove it from the charging base. In this case, you may need to hold the button down until you hear "power off." Then begin the sequence I shared above by holding the button down. It will first "power on" and then say "pairing". 1. Only put on right (R) bluetooth earbud. Now turn on left (L) bluetooth earbuds by holding down button with your left hand. Now put it in ear. 2. Turn on bluetooth capability from desired device (cell phone, pc, etc). 5. Earbud will verbally say "second device connected"
6. Device & ear ups are ready for use. make sure your bluetooth on your device is on, then hold the right (I actually believe either) bud's button down for a few seconds. How do I get the two earpiece to work at the same time? I can get the right side to work. BEST ANSWER: I suggest making sure your case is charged. If it is, and the earbuds are also charged, they should both turn on when removed from the case. If that doesn't happen, or if they have turned themselves off due to disuse, you will need to turn each earbud on individually. Press the button on each for 1-2 seconds until each one turns on. If they are both charged, but still won't turn on, you may have a defective unit. Make sure both are charged. Quickly put both in your ears - you should hear "power on", "connected - left channel connected, right channel connected - second device connected" as it connects to your phone etc. If you are only getting one to work the other is either off (push and hold the button) or you have a bad set, I imagine. the right and the left earbuds each have their own power button. Stick them in yours press the the power for the left button first and you should hear a message telling you that it powered on. Do the same for the right side and the two should automatically pair with one another. I have the same problem. As of a couple weeks ago both left and right were working, but now the left earpiece does not work (no charging light, does not turn on). Return them if they are still within warranty. Turn the left earpiece on. If it doesn't automatically turn on when removed from the charging case, then you can manually turn each earpiece on/off by hold the button on it for a few seconds. Please open a support ticket and submit an rma at monoprice.com , it sounds like your units are defective or incompatible with your device. Is there a way to turn them off other than putting them back in the case? BEST ANSWER: Buds will automatically and after several minutes turn themselves off after using them when out of the base AND while no longer connected to a device. Returning the buds to the base switches the white bud lights on and resumes charging them. I power mine off, and put them in the case, and the lights come on. I go to get them maybe a day or two later and the whole thing is dead. Its like when putting them in the case they turn back on or something. Once all of the paired Bluetooth devices are shut off, the buds will power themselves down after 10 minutes of going to Pairing mode. Can these be used inside a motorcycle helmet while riding? BEST ANSWER: Yes, although in virtually every state here in the US it is illegal to cover both ears at the same time. They fit, pretty well, within the confines of my ears so I would say yes. Sorry I do not know- they work great so I think yes? Will these work with my TV, Iphone, Mac Book, and Ipad? These will work with your MacBook, Ipad, and Iphone as those devices have bluetooth capability. 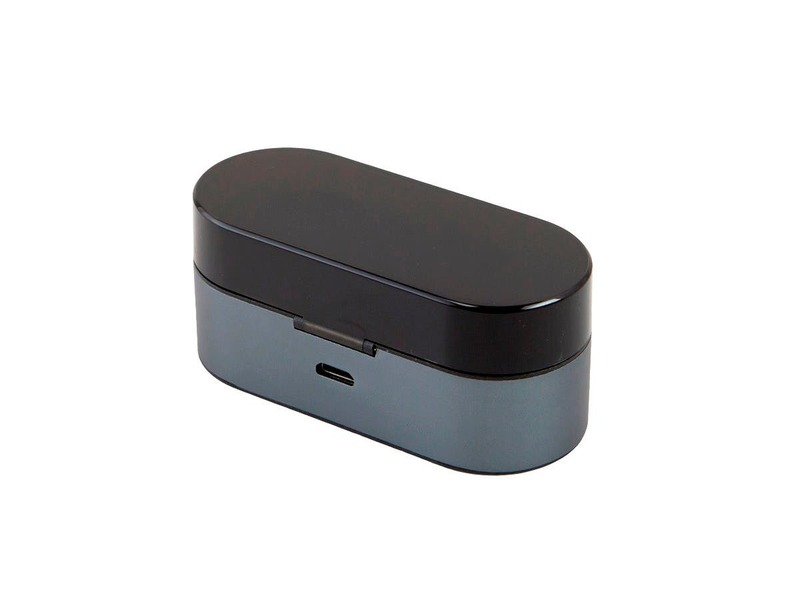 You will need a bluetooth transmitter to receive audio from your TV since this does not have audio in. Can't speak for all of those, but so far I've used them with my iphone and ipad, so I assume they'd work with any bluetooth compatible device. Do these work with samsung phones? I have an iPhone but as long as your Samsung has Bluetooth capabilities, it will work. Yes, it does work very well. Really sound great. Works great with my Galaxy SO. What is the expected battery life and do they have any controls for volume, changing tracks, answering calls? BEST ANSWER: Batteries will last 2-4 hours. They have full control of volume, tracks, and calls. You can answer and decline/end calls, advance to next track, and pause/play existing track. Volume and placing a call is done on the smartphone. I believe the volume, track, and call control is done by adjusting your connected device, e.g. your cell phone . Does the music automatically pause when you remove one earbud? BEST ANSWER: No, the music will not pause when you remove your earbuds. No, but all you have to do is tap the outside of the earbud and it pauses the music. It's very easy to do. You can tap the button on either bud to pause or resume music. Tapping twice skips to next track. How well will these stay in during exercise? BEST ANSWER: I ran in mine on Monday and am about to go out to run in them again today (Wednesday). They stayed in fine. They're small enough to go into the ear canal and be held in place by one of the folds in your ear that folds inwards. I hit the treadmill to walk fast and they stay in. Also had no issues doing kettlebell swings and presses with them in. The only time they come remotely loose is when drinking. Not a problem: they come with 3 sizes of earbud so you can fit the ones that stick the best. I'm a 210 lb guy and the default buds work great for me. How long does the battery last while playing music mid volume continuously? BEST ANSWER: Up to 3.5 hours. I've been consistently getting 2 hours 45 minutes of playing time before the left (master) bud runs out of power. The right bud will stay on for a while afterward, but will shut down automatically after about 10 minutes in this case. In my experience, no more than 3 hours. I listen to podcasts often and most of them are about an hour long so I can't get more than 2.5 - 3 podcasts in before I have to charge them and listen out loud or with a wired set of earbuds. Do these cut out while walking with phone in front pocket? BEST ANSWER: They should not. I use them while working out in the gym. With my phone in my right pocket, the headphones cut out quite a bit while working out. I switched the headphones to opposite ears and it helped. The main one is the left, so as long as phone is closest to the left speaker, it should be fine. I just received these head phones... while my iPhoneX is my left pocket with nothing in there. When I walk it drops often as well. What is the reset procedure for these earbuds? The manual *refers* to a reset procedure, but does not explain it. BTW not looking for how to pair the earbuds with a device - just how to reset the earbuds' electronics themselves. BEST ANSWER: As far as I can tell, turning them off by holding down the button on both earbuds until they say power off and then turning them both back on by pressing the buttons again is how you accomplish this. Note: this is without putting them back into the charge case. I don't know what you mean by reset the electronics. The only thing you can do is pair these with another device. Basically follow the instructions to pair with another device and that's about all you can do to reset it. Hi Eric, monoprice asked me to assist with this question. Unfortunately there is no reset option but you can send the buds back to Monoprice. Please open a support ticket for further assistance. I got them as a gift and when paired it said "second device connected". Would be nice to have an ability to "forget" the first (or all) devices. Has anyone gone running in the rain with these? BEST ANSWER: I have run in them. Ear plugs do not typically fit very well and these were no exception. They worked fine but I found I had to continue to touch them to keep them firmly in place. I wouldn't recommend running with these as they don't anchor well in the ear. No running in rain, but I sweat plenty while working out and no issues. Has anyone purchased these for wearing while riding a Motorcycle? I'm not as concerned with noise as I am with the mic working. The breakdown of the earbud does not show where the mic is. Is the mic pulling from within the ear canal or outside? BEST ANSWER: Not sure where the mic is located but have been told it was difficult to understand me when I answered a few calls while outside, working in my yard. May be an issue while on a motorcycle but may be a little more helpful to have someone who rides to test it out for your specific circumstances. 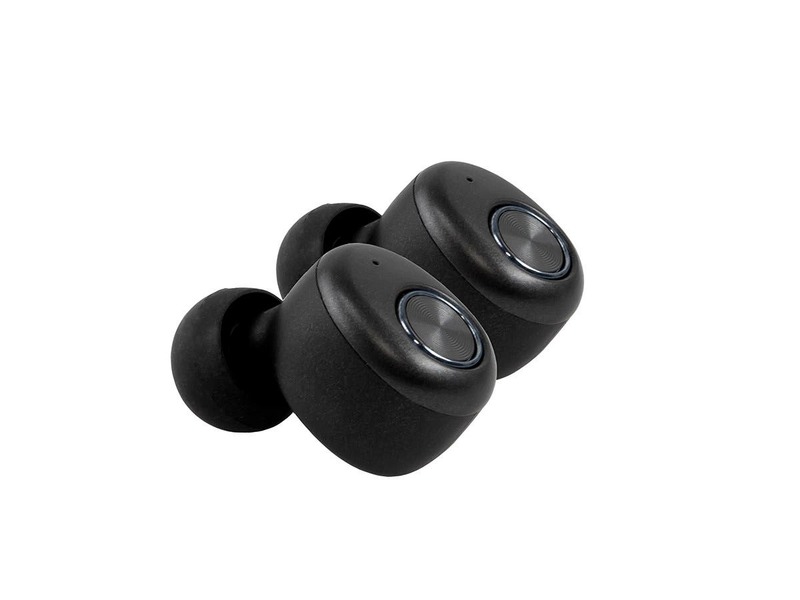 I own these and love them - good sound, pairs quickly with my cell phone, very convenient, good charging case, good pause control by pressing the outside of either earphone. Long run time per charge, Easy charging in the case. But. They don't have a mic. Sorry. The mic is the little dot you see just below the large power button on the outside of the devices. if using while riding, be sure to attach a string or other dummy cord. They do tend to fall out somewhat easily. They do not have wind/noise reduction. Do these have noise canceling technology ? No they do not, but once you have them in, it cuts down on the ambient noise around you a pretty good amount. I use them in a noisy gym with music playing, and i have no problem hearing my music as i would say middle of the road volume over everything else. Can u make phone calls with this product? BEST ANSWER: Yes, touch to activate the mic so you can use voice control. Can you use one earphone at a time? Can you switch to the other one when the first one charges? BEST ANSWER: ONLY Left side of the earphone can be used as one earphone since L side Is the receiver and has the master connection to the music source. Unfotunately, no. 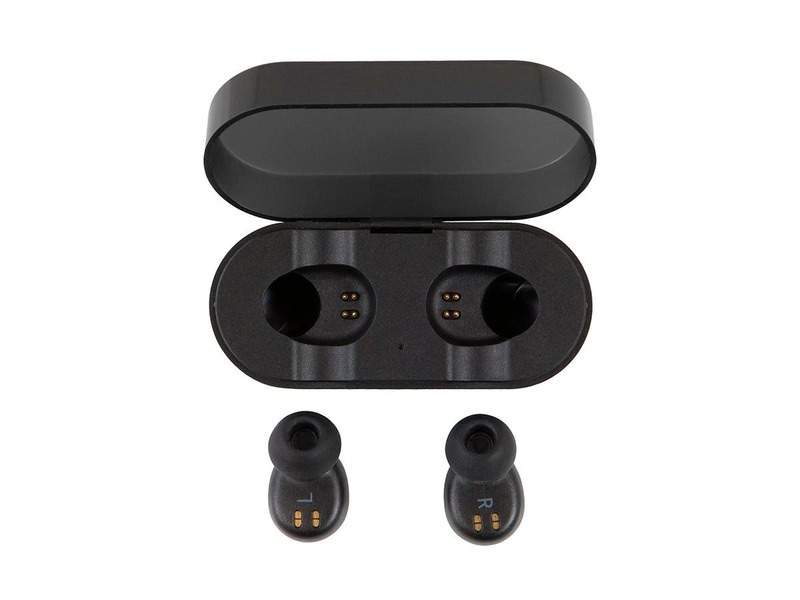 The RH earbud connect to the LH earbud, not the device you're connecting to. Is it possible to use this on a motorcycle for music and phone calls? Without a microphone right near your mouth no earbud set will work for phone calls on a motorcycle. Can this unit be used with an Apple iPad?. A timely response will be greatly appreciated. BEST ANSWER: Yes, it connects through bluetooth. How well do these isolate from external sound? BEST ANSWER: As well as any noise isolating earbuds. These are not noise cancelling but they do fill your ear canal so they so a good job at isolating noise. I use them with my lawn mower and, while I have to crank up the volume some, I certainly don't max out! Please describe the fit and how tight they stay in? I have only found a good fit before with Bose that has wings to keep them in the ear. These look great except there is only a round piece that I haven’t been successful with before as they seem to loosen on me. 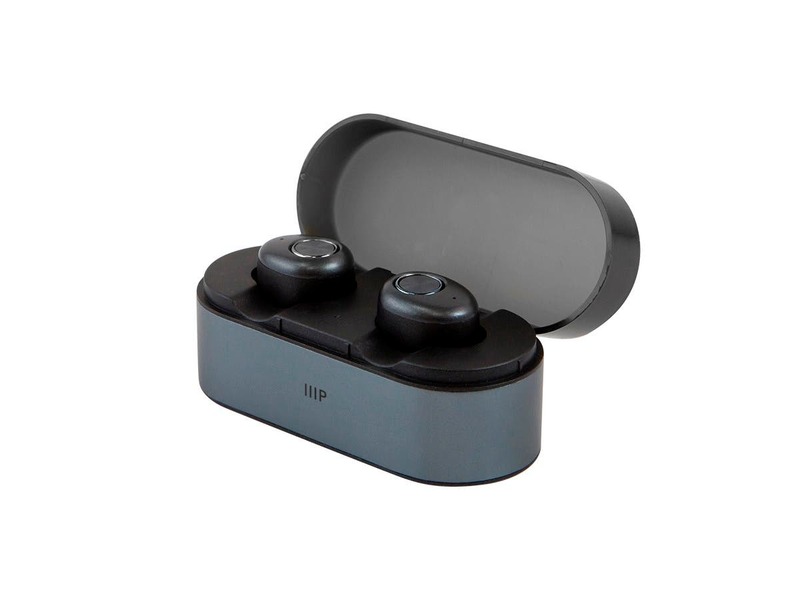 BEST ANSWER: Depending on the earbud tip you use, the unit can stay relatively well within the ear. One friend with this product uses foam marshmallow-style tips for maximum fitting, while I just use a preferred set of rubber tips. Orientation of the unit in the ear will help it stay seated as well. I've had no issues with the earphones falling out unless I'm rolling around on my bed. How can I replace an IPX4 ear piece? 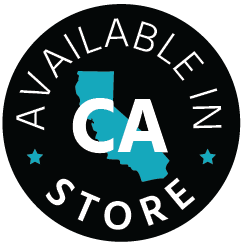 BEST ANSWER: Unfortunately, we don't sell the individual ear pieces. Does the mic work well for phone calls? How clear is the voice? BEST ANSWER: It works! Clear enough that I haven't thought about it. It's the people on the other end of the line that would notice whether your voice is clear, you wouldn't hear it yourself. Sounds like nobody has mentioned it to you. Is there only one speaker driver in these headphones? BEST ANSWER: The only show up as SBC on my devices so I doubt LDAC is supported and I don't own any Apple products so I'm not sure about AAC. They sync up quickly with no issues. Good fit and sound quality. Great product for the price. I’m very happy & enjoining them. I would highlight recommend them for anybody that really wants wireless earphones. Thank you & consumer report for recommending this great product. I’m finding the headsets are not holding a charge. I ride the train an hour each way. I charge them overnight then wear them for 90 minutes then charge them at work and they run out of battery halfway home on the train. I’m disappointed. Very nice even in comparison to Apple air pods. Charge is good and they are comfortable. Really enjoying these wireless headphones. Save your money, time and heart break. 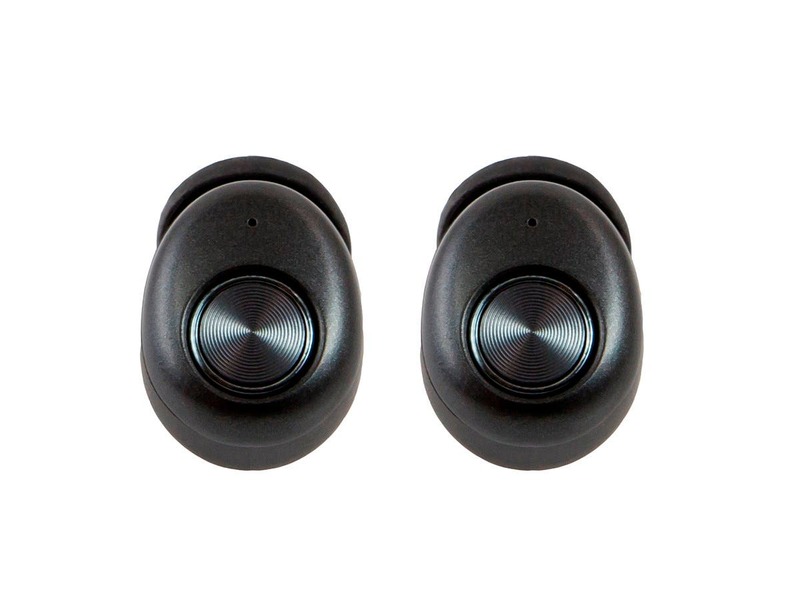 They sound cheap and hollow, the design of them is seemingly decent from a weight and materials perspective, but the ergonomics are not, and you deserve better. As a long time Monoprice shopper, this purchase was particularly hurtful, and I truly wanted them to be even remotely acceptable. But they’re not. These actually have me running back to the free headphones that came with my phone. By these if you want a pair of bad earbuds. Looses pairing all the time. Very short run times. Even in the case, it’s charge only is good for a few hours. Much more useful using these in a slingshot, they do go far that way.